New Delhi, April 16 (IANS) According to an official data, only four of the 44 sitting candidates contesting in the second phase of the Lok Sabha elections had asked zero questions in the Parliament, including Janata Dal (Secular)'s H.D. 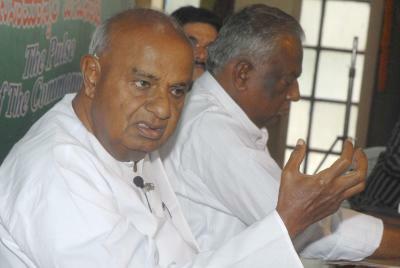 Devegowda. A total of 97 Lok Sabha constituencies across 12 states go to the second phase of the general elections on Thursday. Apart from Devegowda, BJP's Yashwant Singh elected from Uttar Pradesh's Nagina; Congress' K.H. Muniyappa, elected from Karnataka's Kolar; and All India Trinamool Congress' Bijoy Chandra Barman, elected from West Bengal's Jalpaiguri, did not ask any questions in the House. "The four did not move any Private Members' Bill," according to the data shared by PRS Legislative Research. On the other hand, the highest number of questions among the 44 MPs were asked by Shiv Sena's Anandrao Adsul. Adsul asked 1,062 questions in the Lok Sabha between June 1, 2014 and February 13, 2019, it said. With 906 questions, Congress MP Ashok Shankarrao Chavan, elected from Maharashtra's Nanded, came second in the list in terms of questions. All India Anna Dravida Munnetra Kazhagam's J. Jayavardhan, elected from Tamil Nadu's Chennai South, asked 816 questions in the House, according to the data. Congress' Biren Singh Engti, elected from Assam's Autonomous District, raised only one question in the House. Among the 44 MPs, four were Ministers in the Cabinet. D.V. Sadananda Gowda, Jitendra Singh, Jual Oram and P. Radhakrishnan were representing the government in the House. The 97 constituencies across Assam, Bihar, Chhattisgarh, Karnataka, Jammu and Kashmir, Maharashtra, Manipur, Odisha, Tamil Nadu, Tripura, Uttar Pradesh, and West Bengal go to polls in the second phase.